How about visiting a bog? The treasure of Urbana State Forest, between Pratttsburg and Hammondsport, is high elevation Huckleberry Bog. Bogs such as this one began their life as glaciers retreated from the area. They left depressions, called glacial ponds, which filled with water from melting snow or rain. With no inlet or outflow of fresh water, the ponds then relied on rainwater for replenishment. Due to the low mineral content of melted ice and rainwater, these ponds were not attractive to the usual microscopic flora such as bacteria and fungi. Instead, the ponds were colonized by sphagnum mosses and heaths such as leatherleaf. The sphagnum moss consumed what minerals existed and excreted acids, producing acidic water. Over long periods of time, the moss built layers upon itself. The compressed moss formed a quaking mat over the water and became peat. In a mature bog, the moss may cover almost all the water and become so thick that it can even support a person’s weight. Walking on a bog is like walking on a wet sponge. Because the bog pond is replenished only by rainwater, it is low in oxygen. Add this to the low mineral content and acidity and you have a unique environment, one that is not enticing to most wildlife and one that supports rare species of plants. Bogs are home to carnivorous plants that trap and eat insects. These include the pitcher plant, sundew, and butterwort. They are also home to flowering orchids, water willow (a loosestrife), leatherleaf (an evergreen in the heath family), and wild cranberry plants. Most trees dislike the acidic conditions of the bog. The exception is the tamarack or larch, which can be found along the edges of the bog. The peat from bogs was a precious commodity in years gone by. For centuries, northern Europeans dried the peat and burned it as fuel. It has twice the heating value of wood and two-thirds the heating value of coal. In World War I peat was used to wrap wounds because of its anti-bacterial properties and absorbency. It has also been used as diapers. Today people add sphagnum moss (peat) to soil for potting houseplants and landscape gardening because of its water retention properties. Huckleberry Bog supports high bush and low bush blueberries, and sphagnum moss, but no huckleberries. Huckleberry Bog is a misnomer that got applied to this area and stuck. High bush blueberries are the 4 to 5 foot tall bushes that surround the observation deck overlooking the bog. Their berries are small but tasty. The less than one-foot tall bushes that carpet the forest are low bush blueberries. These berries are tasty too, but even smaller. Huckleberry Bog is one of several bogs you can hike to or paddle in Central & Western new York State. Footprint Press guidebooks give you plenty of options. 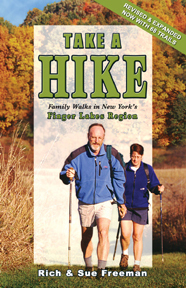 Huckleberry Bog can be found in Take A Hike – Family Walks in New York’s Finger Lakes Region. Be sure to check the home page at http://www.trailworks.org/ for additional information, including events.